The Southern Fleurieu Historical Museum at Port Elliott is built on the strongest of all foundations; the combined vision of two far sighted men, the late David Coote of Middleton and late Ken Ekers of Mt Compass. Collections of both men, form the basis of the Museum's agricultural focus, together with additional items of interest from domestic use in the period prior to 1960. Since the official opening of the new relocated museum on April 26, 2014, there has been encouraging continual development based on this solid foundation. The late Ken Ekers of Mt Compass (pictured) was a collector with a dream of setting up a museum of local machinery which had a known connection to the district. 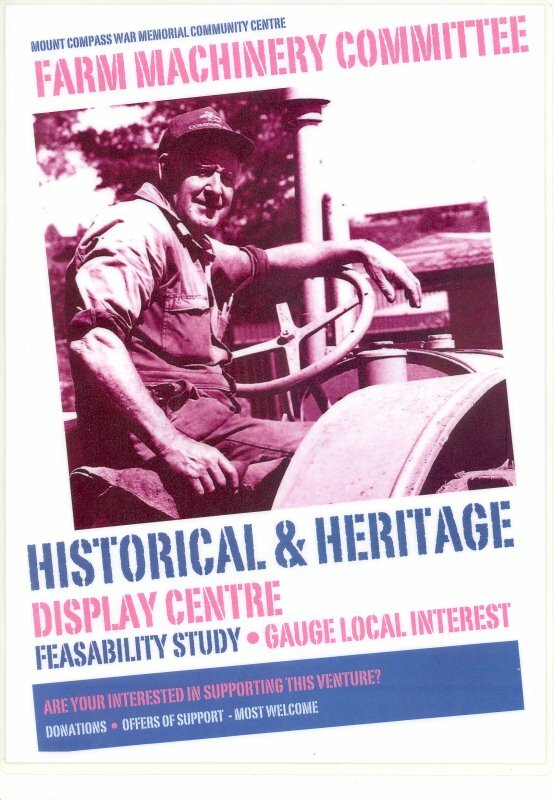 Below is the poster produced to advise and gauge interest in creating a museum at Mt Compass. Sometime in 1990s there was quite a bit of work done towards a museum in Mt Compass but it did not come to anything. Recently Ken's brother Colin became interested and got something started. There did not seem to be any chance in the near future to get anything in Mt Compass so efforts were made to see what could be achieved elsewhere. The idea then developed to possibly combine with the Southern Agricultural Society Inc. in Pt Elliot. 1909 a pig stud, fruit, vegetable and egg marketing with honey from Italian bees. 1926 establishment of a dairy cow herd - and – 1936 establishment of an Illawarra Shorthorn Stud. Among museum display are many pieces of horse-drawn equipment used over the years by the Coote family, including Norman and David. One is a 1920 horse-drawn David Shearer and Son stripper harvester, built at Mannum South Australia, based, on the John Ridley design. Also on site is a 1944 Stationary Wire tied baler, that has been faithfully restored by museum workshop members to working condition. A 1953 McKay binder, made at the famous Sunshine Harvester Works in Victoria, was brought by the Coote family for Three Hundred and Fifty Pounds to fit behind a Fordson Major tractor. A combined meeting next took place to discussed the proposed combining of Ken Ekers collection with that of David Coote with the Mt Compass Community Centre Committee. At a very cordial meeting of the 3 groups involved the idea of moving to Pt Elliot and combining with their already started museum project was easily accepted by all present. The Ekers family link to farming began when Laurie Ekers and his bride settled after purchasing 1000 acres of undeveloped land for One Pound an Acre A special sulky belonging to the Eker's family is a focal feature at the new museum .The sulky was given to Ken and Colin's mother, Elsie (nee Plaisted) by her family as a wedding present. Elsie, daughter of the Wool Bay harbourmaster, postmaster and general store keeper, Thomas Plaisted was courted by Laurie Ekers, who had been working at the Lime kiln and loading ships nearby. Elsie and her husband Laurie , married in 1927 drove the sulky on their honeymoon from Wool Bay on the Yorke Peninsula to Mount Compass to start a new life. Used until 1937, the sulky was then stored in a home shed,until being restored in 2012 and becoming part of Ken Eker's collection. Members of the Southern Agricultural Society, under the direction of Deane Perry had done a lot of work regarding the establishment of the museum at the old location. Some new workers were needed to get started and push forward. A new Museum Sub-committee was formed under the umbrella of the Southern Agricultural Society Inc. Committee. This was the springboard for the fledgling museum to gain a much needed momentum. Since moving into and occupying the new purpose-built museum after the Port Elliott Show progress has been at a constant pace. The move prompted more action with a steady dedicated group of members using amazing expertise on restoration projects, expansion of buildings and display areas. Support for the museum has come from generous donations of both items and monetary gifts from considerable sources. Museum visits from individuals and groups has been also bringing in a steady source of income. Port Elliott Primary School and Museum community project.Skilled volunteers have been sharing skills a “hands-on” project with a special group of school students, supervised by a school teacher. The work began in 2011 under the direction of Doug Box with the team doing a variety of tasks to restore a fence post drilling machine and other equipment . These enthusiastic children learn how to maintain and repair items, using basic equipment while in a mentoring situation with the older generation. Restoration of Tugwell Wagon - one of the earlier projects - from ruin to reality. Originally owned by Joshua Tugwell, Port Elliott resident from 1901 this was one of the wagons used in his carrying business from Adelaide to Victor Harbor and Port Elliott. Using three teams of horses he was assisted by sons Joshua Jnr. and Frederick Tugwell. In 1911 a motor van replaced the horses. During World War Two Mrs Tugwell carted vegetables in this wagon from their small farm in Waitpinga. Later,the then owner Daniel Tugwell carted flowers and vegetables from his market garden in Encounter Bay to Victor Harbor. After being carefully removed from its resting place of many years in a derelict condition it was meticulously restored by Museum volunteers. Flat Bottom Wooden Boat Built and owned by Mr Phil Basham, a local farmer this clinker built dingy was used from 1937 for fishing and family recreation activities, and stored in a stone walled shed at Fisherman's Bay/Sandy Bay, close to the family's historic property of “Pleasant Banks” at Port Elliott. After being restored at Armfield's Slipway, Goolwa it was donated to the Museum in 2013. The myriad of domestic and commercial items tastefully displayed covers many facets of early community life; covering everything possible including cooking utensils, home decorating, sewing items , butter making, hand written home and farm record keeping, men's hand tools, kitchen and commercial scales, period clothing and furnishings – even unique things like a hand operated grass cutter – for chopping grass into small pieces making chicken feeding easier. An upright German-make C.Weidig iron-frame stencil piano, popular in many 19th and early 20th century homes - this item holds treasured memories for long-serving museum promoter, President Deane Perry whose grandfather owned and played the instrument. Museum workshop and extension. A dedicated group of members, displaying an amazing range of skills have undertaken restoration projects. No item has proven to be beyond the expertise of these men working on varying types and sizes of items from ancient mantel clocks to horse-drawn wagons. Equiping the workshop with necessary tools and equipment has come mainly from donations. The workshop's recent extention, known as The Watson Wing honors Dean Watson, a member who has also donated many historical items to the museum. The wing also includes a storage space for showground maintenance tractors and mowers. As well a new separate large building houses a private collection of faithfully restored historical tractors and some museum historical vehicles. The cost of the building was generously met by the museum member and owner of the collection. The Shed as the building is known was donated by Dennis and Noeline Hill. Richardsons Market Trolley- another workshop restoration was owned and used by Jack and Fred Richardson, brothers and vegetable growers of Uraidla, in the early 1900's. One of four trolleys of varying sizes used, it was packed with potatoes and onions on the base, topped with bunched vegetables such as carrots, peas, beans, etc., hitched to four Clydesdale Draught Horses for the Adelaide market run. The trolley weighed between three to six tonne per load. Because of the steep decline into Adelaide two extra horses were added for the long Nine Mile track to Greenhill Road, where these two were released and a number of stringy-bark tree logs, acting as brakes were added for the steep decline into Adelaide. Major restoration of Granite Island Train. For 30 years a unique-looking truck or van powered by a Land Drover diesel engine towed locals and visitors across the Granite Island causeway. Then it was retired to 30 years weed engulfed in an Inman Valley paddock. Coming out of retirement members again undertook the challenge of restoring the rusting treasure. Firstly the original carriages were beautifully restored to be used as an attraction, although tractor-pulled, at the 139th Port Elliott 2015 show. The original train “engine” , being thoroughly and faithfully restored is still a “work in progress”. Funding has been possible through sponsorship of the Alexandrina and Victor Harbor Councils.